About a year ago, we Moscow Friends agreed that each week we would try to arrange some kind of spiritual conversation after meeting for worship. In recent months we've used the joint declaration of the Pope and Patriarch for this purpose, as well as the epistle from the Friends World Committee's world plenary gathering in Peru. A third person asked, "Why do you prefer Kelly? What do you think Kelly would say to Grits?" We decided to schedule a discussion at a future meeting: we would read both essays and comment on how they spoke to each other. The Kelly fan, Misha, promised to lead the discussion. Along with the Ilya Grits handout, we had plenty of copies of Thomas Kelly's book, A Testament of Devotion, in the late Olga Dolgina's beautiful Russian translation. We had some time to prepare -- our meeting place wasn't available on Victory Day weekend, so we gathered again in mid-May for our conversation. Only seven of us participated in the discussion, but it was lively and went on longer than I'd dared hope. "Can we really include terrorists and sociopaths in Ilya's definition of the 'people of God'?" "There's really no conflict between these authors. They both evoke images of concentric circles around the central trunk, God. But Kelly's concentric rings are in order of spiritual intimacy, while the 'People of God' circles are defined by the various covenants between God and God's people." 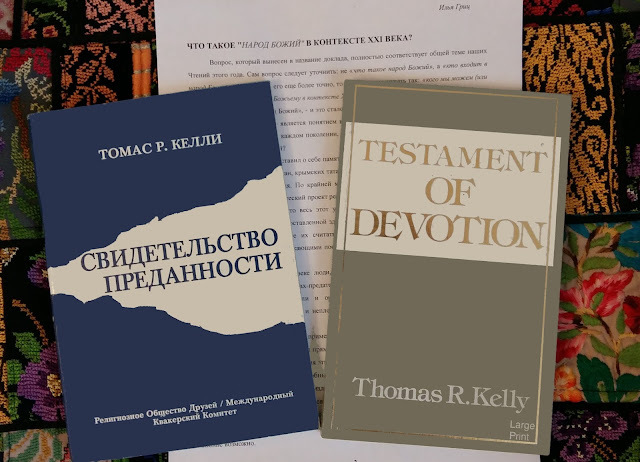 "Kelly is strongest in describing how we recognize the people who become our deepest spiritual friends. Sometimes those people come from social ranks different from our own. His circles don't conform to the circles defined by habits of elitism. In this he's not far from Ilya Grits." I'd love to know: what food for spiritual conversation in your church have you found recently? Have you tried bringing two different authors together for comparison? Not only do our daily friendships become realigned; our religious friends are also seen anew. Many impressions of worth are confirmed, others are reversed. Some of the most active church leaders well-known for their efficiency, people we have always admired, are shown, in the X-ray light of Eternity, to be agitated, half-committed, wistful, self-placating seekers, to whom the poise and serenity of the Everlasting have never come. The inexhaustible self-giving of others of our religious acquaintances we now understand, for the Eternal Love kindles an ardent and persistent readiness to do all things for, as well as through, Christ who strengthens us. In some we regret a well-intentioned, but feverish over-busyness, not completely grounded in the depths of peace, and we wish they would not blur the beauty of their souls by fast motion. Others, who may not have been effective speakers or weighty financiers or charming conversationalists or members of prominent families are found to be men and women on whom the dews of heaven have fallen indeed, who live continuously in the Center and who, in mature appreciation, understand our leaping heart and unbounded enthusiasm for God. And although they are not commissioned to any earthly office, yet they welcome us authoritatively into the Fellowship of Love. More about scholar and translator Olga Dolgina. We miss her! Cherice Bock looks toward an ecotheology of critical hope. She summarizes her article as published in Cross Currents and provides the original text as submitted to the journal. Whereas oligarchs from outside the west operate from a logic of "demand-side" corruption seeking discreet locations to launder money, the west operates from a logic of "supply-side" corruption. Is there a health benefit to church attendance? Cautiously interpreted, maybe so!